once.daredevil 11 months, 3 weeks ago. OFFICIAL LineageOS 15.1 for Nexus 6 (shamu) is now available to download on the OFFICIAL LineageOS website. This OFFICIAL LineageOS 15.1 for Nexus 6 is maintained by Elektroschmock, razorloves and npjohnson. Make sure to have a Custom recovery like CWM or TWRP or any other custom recovery on your phone. If you don’t have then download the recovery for Nexus 6 from above link and follow the Custom Recovery Installation Guide (it’s a generic guide which will work for TWRP as well as CWM recovery or any other recovery) provided it is in .img file extension. Reboot and Enjoy Android Oreo on the OFFICIAL LineageOS 15.1 for Nexus 6. 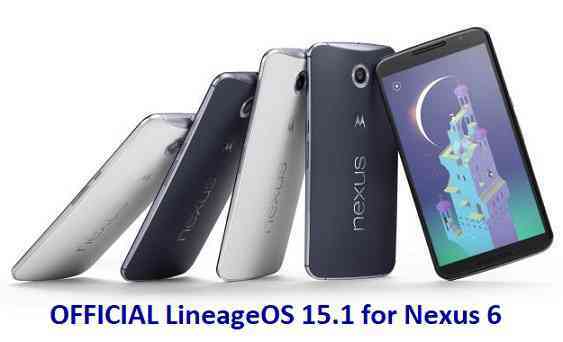 Copy the latest Lineage OS 15.1 for Nexus 6 ZIP file, Oreo 8.1 GApps and/or supersu ROOT package to the phone or use the updater app to download the LineageOS 15.1. If you have found any BUG on this OFFICIAL LineageOS 15.1 for Nexus 6 then you can raise a jira ticket on LineageOS website. Stay tuned or Subscribe to the Nexus 6 (shamu) forum For other Android Oreo 8.1, Nougat ROMs, LineageOS 15.1 ROMs, other ROMs and all other device specific topics. OFFICIAL LineageOS 15.1 for Nexus 6 (shamu) is now available to download on the OFFICIAL LineageOS website. Hi. I do not yet see a LineageOS 15.1 build available for download in the list of official Nexus 6 (shamu) builds. Also, not yet available for download using the updater app from the LineageOS 14.1 shamu build. Am I looking in the wrong place? I’m looking forward to trying it out. For shamu, the OFFICIAL LineageOS 15.1 build starts on Monday, of every week. Just now I have verified and found that there is an OFFICIAL build of LineageOS 15.1 for Nexus 6 is available. The 15.1 build is now available in the list of official Nexus 6 (shamu) builds. Make sure you have a very recent custom recovery version on your phone. I thought TWRP 3.0.3.0 from last December would be recent enough. It wasn’t. When I attempted to flash the 15.1 build it kept throwing errors and failed no matter what options I chose. I upgraded to the latest TWRP 3.2.1-0 image and the flash succeeded, albeit only after I disabled ZIP verification. The bigger issue with this build on my Nexus 6 is that Privacy Guard pops up and either locks up the phone making it completely unresponsive or causes spontaneous reboots. This is the most serious issue I’ve encountered, and if I cannot resolve it, I may need to revert to a 14.1 build. Also, the version of Gmail that comes with the 15.1 GApps (I used OFFICIAL Oreo 8.1 Mini GApps Download link for ARM 32-bit Android) has a pop-up that appears on my Exchange account every time I open the Gmail app. It cannot be suppressed no matter what option is chosen within the Gmail app, or notification settings. Others have reported this issue and I’ve seen no reported solution, other than abandoning Gmail as the mail app. Just would like you to know the latest build works like a dream.